B.Ed Diploma in Animal Rehabilitation (IAAT), Certified Canine Rehabilitation Practitioner (CCRP), Level 3 Certificate in Hydrotherapy. 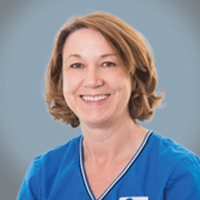 After many years in veterinary practice as a nurse, Donna took time out from work to bring up her family and in 2005 joined the Canine Care Centre at Ringwood as a hydrotherapist. Following two years there, she took her Diploma in Animal Physiotherapy with the International Association of Animal Therapists (IAAT), and since then has worked for SCVS full-time as physiotherapist in the Animal Rehabilitation department. In 2009 Donna completed the University of Tennessee outreach programme in canine rehabilitation to become a Certified Canine Rehabilitation Practitioner.